A version of this article was originally published August 23, 2018 on Greentech Media. Coal and nuclear facilities are facing a tough economic reality in the United States. Competitive power markets are oversupplied, while natural gas and renewable energy are undercutting coal and nuclear on cost. State policymakers face hard choices about how to define a pragmatic approach to nuclear facilities, depending on how they value pollution. But there are no good reasons to believe coal will become competitive on cost or pollution grounds anytime soon. Last year, the Department of Energy (DOE) proposed a federal bailout for power plants that could prove they had a 90-day supply of fuel on site, suggesting that imminent coal and nuclear retirements would constitute a national emergency. But the five bipartisan members of the Federal Energy Regulatory Commission (FERC) unanimously rejected DOE’s proposed market intervention in January of 2018, citing a lack of evidence that retiring coal and nuclear facilities would cause reliability or grid resilience concerns out of the normal course of business for the nation’s power grid. However, a DOE memo made public earlier this summer suggests the agency is still considering exercising emergency authority to require electric consumers (or possibly taxpayers—the same individuals!) pay above-market rates to ensure certain coal and nuclear plants stay online, despite mounting evidence from grid operators that these power plants are not needed. Analysis of the original bailout proposal, conducted by Energy Innovation and the Climate Policy Initiative last year, suggested that keeping uncompetitive coal and nuclear facilities in the black could cost consumers up to $12 billion per year. FirstEnergy has been among the loudest voices clamoring for a coal and nuclear plant financial rescue, and it’s no wonder why – new economic realities are hitting the company hard. Its competitive subsidiary filed for bankruptcy last spring after filing a deactivation notice for three of its uncompetitive nuclear power plants, and last week it filed worker retraining plans for these plants with federal regulators. FirstEnergy’s market-exposed power plants would need about $1 billion per year to keep running profitably. Assuming the two-year price support referenced in DOE’s memo from earlier this summer, that would imply subsidies of about $2 billion over two years to keep six of First Energy’s uneconomic plants operating. $2 billion over two years to one company is a shocking amount of money to squander in the face of underlying economic trends that show no signs of reversal. So, assuming price supports went forward, it’s quite reasonable to think that the same retirements would be imminent for FirstEnergy at the end of the period. And the affected communities would still face the same tough economic and employment questions in two years. But what if funds were instead directed to support impacted workers and the communities that host power plants that can no longer compete in power markets? What if funds went directly to communities to support the inevitable transition, diversifying local economies and setting the stage for longer-lasting solutions? In the case of FirstEnergy, if the same $2 billion was directed toward locally-led solutions in each of their six affected communities, instead of keeping these uneconomic power plants running for two more years, it could provide more than $300 million per community. The idea may seem far-fetched, but it’s already been implemented in New York. Consider Tonawanda, located outside Buffalo, where a 750 megawatt coal plant recently announced retirement. The town released a redevelopment blueprint to replace lost tax revenue and jobs after a coal plant closure, and New York State’s legislators passed a budget bill with funding to cover nearly 80 percent of a $6 million gap in tax revenue for the first year after the coal plant closes, plus additional support to fill a declining share of the tax revenue gap for another six years as Tonawanda fosters an economic transition. The total spending for a seven-year cushion will likely be around $45 million. Compare that to the $300 million for each of the six power plant communities that could be available if two years of bailout funds were reallocated in this way. If political will exists to make federal or state funds available to keep uncompetitive plants online for a few more years, those same funds could be better used to cover gaps in tax revenue, help workers retrain for new jobs, and help fuel local economic development in affected communities as they transition away from reliance on the power plant. For example, since the initial Tonawanda support was approved, the New York State legislature and the governor has acknowledged broader electric sector economic trends and recently increased this kind of transition support to $45 million, making it available to other communities facing power plant retirements. FirstEnergy won’t be the last case of coal or nuclear plants being priced out of power markets, be they competitive or monopolistic. 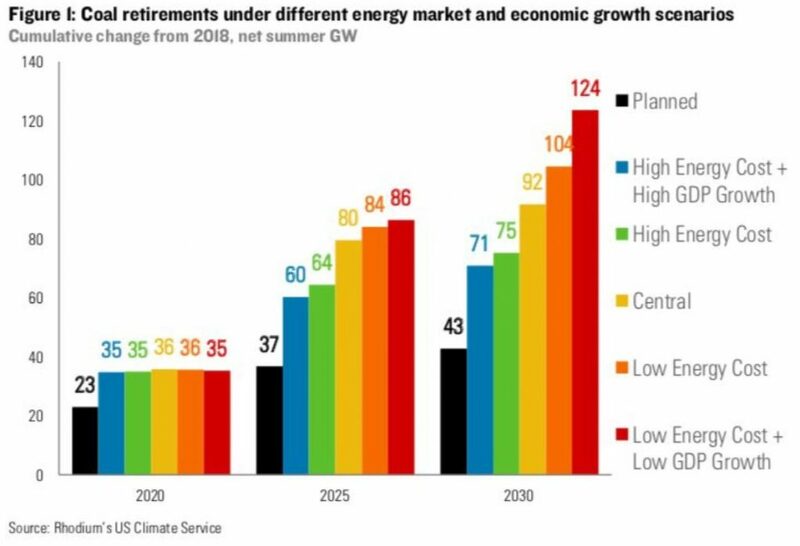 Coal plant retirement has accelerated in recent years, and is projected to continue. According to the RhodiumGroup, between 28 and 50 percent of the existing coal fleet will retire by 2030, though only 18 percent has announced retirement today. Depending on how policymakers choose to value carbon-free electricity, nuclear power could also continue to suffer. A transition plan becomes vital in this context, and we still have time to be proactive. Other states may be able to follow the Tonawanda model, and in some cases coal generation sites may be suitable for redevelopment ( promising work on brownfields to brightfields, for example) to can help moderate economic damage. Another model is emerging – leveraging utility balance sheets to transition from fossil to clean. In vertically integrated markets like Public Service Company of Colorado, uneconomic coal power plants are being retired, and utility funds reinvested in clean energy located in the same communities, like the plan to retire a coal plant in Pueblo County and replace it with local solar and wind power plants. In Arizona, where the Navajo Generating Station retirement threatens to devastate two Native American Tribes’ economies, the future is less clear. Solar and wind resource potential on Navajo lands holds promise for longer-lasting benefits that can similarly be contrasted with proposals to prop up coal plants temporarily. In short, communities where these plants are located—not the federal government and power plant owners—should be in charge of deciding how any available funds can best be spent to support them in this economic transition. If state or federal policymakers want to put workers first and support communities facing power plant closures, they could generate a more positive impact by giving any available funds to the affected communities to use however they want to support a just transition, diversifying local economies for long term success.